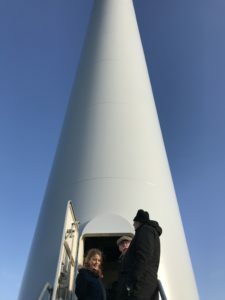 On Friday 14 December 2018 customers, friends, and partners were welcomed at the open day of EWT’s first operational turbine in Germany. Guests included various energy suppliers, banks, farmers, wind industry experts and more. 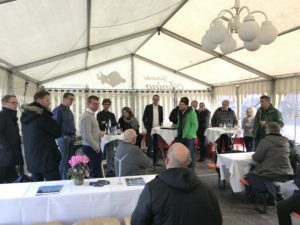 EWT’s Bas Hoogeveen welcomed everyone with a short speech, followed by some words by the owner Mr. Pohlkemper, and finally a planning overview by local expert Gregor Niehoff. Guests were then welcomed into the operating DW61*750HH69 turbine and given a technical overview by Constantyn Heupink, EWT Control Room Engineer. Afterwards, and in good German fashion, turbine owner Mr. Pohlkemper opened the beer taps. Mr. Pohlkemper’s EWT turbine provides electricity for his massive livestock facilities, providing energy for lighting, ventilation, and heating/cooling systems. His DW61*750 proudly demonstrates the feasibility of self-generation projects in Germany, benefiting from the EEG subsidy scheme as well as privileged planning permission for renewable energy generation stations up to 750kW.